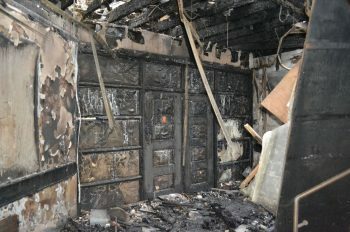 Pictures released by Dorset Fire & Rescue Service last year demonstrate starkly the benefits of fire doors in slowing the spread of fire, restricting damage and – most importantly of all – giving people more time to evacuate. Readers might recall seeing these benefits play out under test conditions – during a live fire door test by the British Woodworking Federation for example. But it’s rare as it is helpful to see the benefits in a real-life scenario too. The fire, which began on the roof, fortunately occurred during school holidays. It had been burning for more than hour before a 999 call was made. By the time fire engines arrived it was impossible for firefighters to get near it so the blaze remained unsupressed for several more hours – and still, the fire doors stood firm, as the pictures clearly demonstrate. 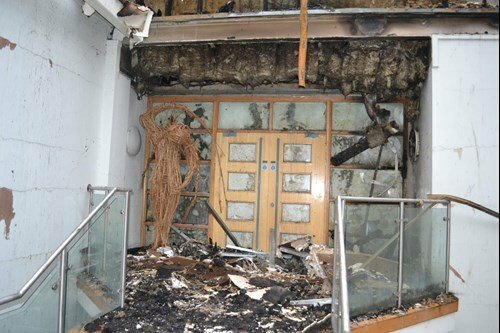 Neil Ashdown, general manager of the Fire Door Inspection Scheme added: “These images show just how important it is to ensure that the people responsible for fire-door installation and maintenance are aware of the faults we see. Source: originally published by Adam Bannister at IFSEC Global.